Welcome to GargWiki, the ultimate reference guide to the world of Disney's Gargoyles! 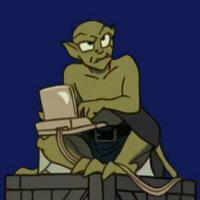 Although GargWiki contains information on anything and everything relating to Gargoyles, the primary focus of the wiki is the canonical Gargoyles Universe, as envisioned by creator Greg Weisman. This includes the first two seasons of the television show and the comic book series by Slave Labor Graphics. GargWiki is an invaluable resource to fans of Gargoyles and a great way to familiarize yourself with the series if you're new to the property. Feel free to look for your favourite characters with our search bar on the left of the screen, check the most popular pages, or browse the site using our category system (the top-level categories are listed in the banner at the top of this page). But remember: GargWiki is always growing, and you can help out! If you want to contribute, have a look at our Community Portal, which has tips for getting started and a list of useful jobs you can do. So come on in, and welcome to the world of Gargoyles! Castle Wyvern is an ancient fortress built on Wyvern Hill in Scotland as a result of an alliance between Prince Malcolm and the Wyvern Clan. The Castle was well protected by its location, the human archers and soldiers, and most of all, the gargoyles themselves. However, in 994, after a series of attacks by marauding Vikings and due in large part to betrayal by the Captain of the Guard and Demona, the Castle was sacked and all but abandoned. The Castle gained a reputation for being haunted over the centuries and fell into ruin. Finally, a thousand years later, David Xanatos arrived and promptly bought the Castle and moved it to Manhattan piece by piece. From then on it stood in pristine form as the pinnacle of the Eyrie Building. GargWiki is a reference guide to all things Gargoyles, both in-universe information (characters, places and things) as well as Category:Out-of-universe information (including cast members and episodes). GargWiki focuses on information from the first two seasons of the animated series Gargoyles, the SLG comic book series and its spin-off. This information can be found in Category:Canon. Since the series ended, Greg Weisman has revealed many secrets and plans he had for the Gargoyles Universe, including spin-offs and new characters. Entries on these revelations are located in Category:Canon-in-training. Some canon entries contain text written in bold, blue type. This signifies, for easy distinction, Canon-in-training material in a primarily Canon entry. Finally, Category:Apocrypha is dedicated to non-canon Gargoyles material, such as The Goliath Chronicles, the Marvel Comics series, the Disney Adventures comic and the Sega Genesis video game. Timeline - Our comprehensive timeline of all events that have taken place within the Gargoyles Universe, from pre-history into the distant future. Episode Guide - A complete listing of television episodes, comic book issues and other stories relating to the world of Gargoyles. Gargoyle - The eponymous species: statues by day, warriors by night and born to protect. Goliath - The heroic gargoyle leader of the Manhattan Clan and main protagonist of the series. Demona - The immortal human-hating female gargoyle, once Goliath's mate but now one of his deadliest enemies. Station Eight - Home of the Comment Room and ASK GREG. The Gathering of the Gargoyles - The web portal for the Gathering of the Gargoyles. D.Taina's Gargoyles Imagery Resource - The personal website of GargWiki's graphics wizard, D.Taina. This page was last edited on 14 January 2018, at 18:49.